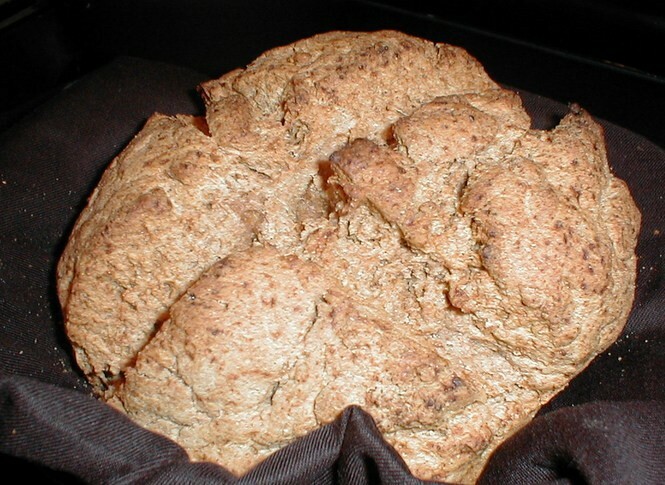 When I cook corned beef and cabbage for St. Patrick's Day I like to have wedges of thick, rich Irish soda bread alongside for soaking up the delicious juices. This is one of the best and easiest recipes I've found. Lightly grease a large baking pan or sheet. In a stand-up mixer or large bowl, mix together the flour, sugar, baking powder, baking soda, salt, margarine, egg and 1 cup of the buttermilk. Turn the dough out onto a flour-dusted surface, knead lightly and form into a round. Place the dough onto the greased baking sheet. Whisk together the remaining 1/4 cup of buttermilk and the melted butter in a small bowl. Brush the loaf with the butter and buttermilk mixture. Cut an 'X' into the top of the loaf with a sharp knife. Bake in the oven for 45 to 50 minutes, or until a knife or toothpick inserted into the loaf comes out clean. You can brush the loaf once or twice with any leftover butter/buttermilk while it bakes.